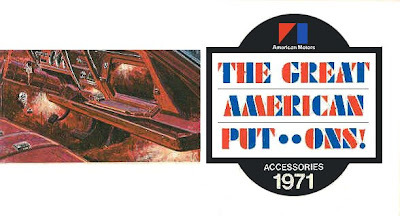 The American Motors brand of the '70's, straightforward, practical, honest. 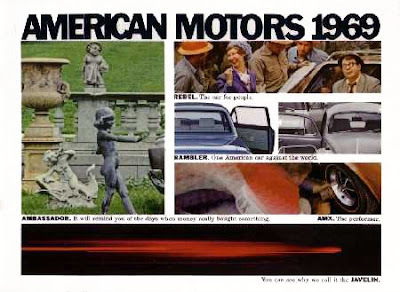 AMC was one of the few car companies to thoroughly revamp it's identity during the decade, resulting in an identity more modern than the big three. 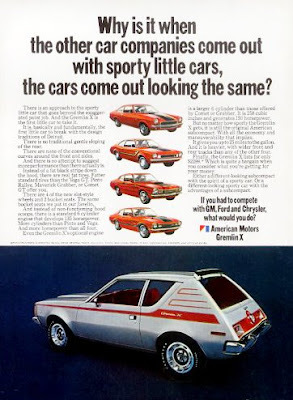 I feel that the visual identity of the AMC brand related most with the simple, eyes-open design of the Pacer resulting in an almost perfect combination. Ironically for a company getting so much distance from being an American car company, the brand has firm roots in swiss design. The Swiss-designed Helvetica typeface was a fresh idea at the time - the typeface was barely thirteen years old. AMC's treatmet of the typeface appears to be tracked a little tighter than usual, imparting a cohesiveness to the logotype. By cleverly constructing a graphic A from the negative space between the two colored shapes, the mark manages to to identify the company and tap into patriotic feelings with the absolute minimal detail. The print materials continued with the simplicity. 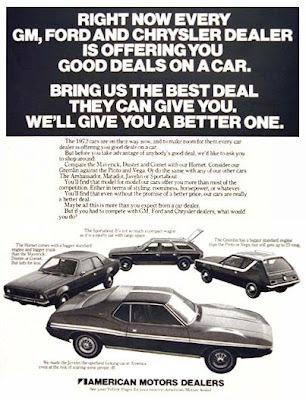 Using the Ogilvy print ad formula of a photographic image and a large white field with black type, the ads hint at future advertising that including Volkswagen's New Beetle, and Apple's iMac campaigns. 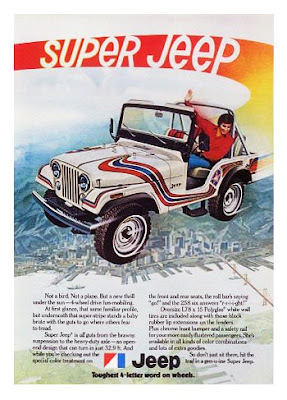 The mark was also used for Jeep, which today uses the same helvetica type as it did in the '70's. 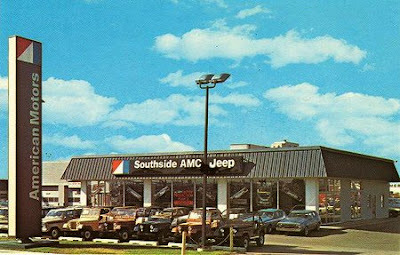 The look was continued to the physical dealerships using the skinny slab signage. 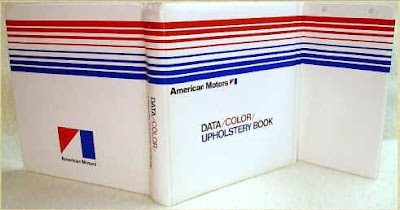 Whenver I see the American Apparel brand today, I see American Motors. Same stripped-down sensibility, different decade.